Ok, I have two things to admit. I saw Easy A, and it was actually my second try because somebody I know (me) fell asleep the first time around. I was on vacation in California last October, for my friend Kathy’s baby shower, and we went to the drive-in for a double feature of chick flicks. It had nothing to do with Easy A, I was just out like a light after watching Life As We Know It. I hadn’t heard much about the film at that time, but watched it this week knowing audiences responded favorably. Olive (Emma Stone) is living in a rumor mill about her fictional sexual escapades — most of which she made up herself to bump up her social status. She also tests how far people will go to take advantage of her — rumors or not — and then tells the truth in the end to prove she is the better person. Olive is used and betrayed by her best friend, and countless teen boys also looking to improve their image as one of her suitors. Those who didn’t like her in high school anyway take it to the next level, such as Amanda Bynes’ popular and very religious character Marianne. As with just about every movie in this genre, there’s a moral to the story, a set of quirky parents thrown in, and the main character ends up with their love interest. Easy A resembles a mix of Saved, Juno, and Mean Girls with a touch of classics from the 1980s like Can’t Buy Me Love or Sixteen Candles. And, in perhaps one of the most clever features of Easy A, the film specifically references plot lines from the John Hughes era. After watching Easy A, my friends and I discussed whether it and the like will carry a similar legacy as those from the 1980s. I am guessing since Easy A included scenes from several 1980s films — Say Anything, Breakfast Club, Sixteen Candles and Can’t Buy Me Love — that it will not get to that level on its own. At least the film’s creators are honest and know those classics hold a place in the hearts of every girl, from their teens and beyond. The 1980s were an influential decade and I’ll admit in high school I too wanted Jake Ryan (or my crush at the time) to show up at my house with a sports car or John Cusack with his radio outside blaring Peter Gabriel. All cheese aside in those stories, I do think they somehow shaped women in my generation’s expectation of romance when they meet “the one.” Sure, I’m a grown up and I realize it was all just a movie, but I will now know that kind of chivalry when I see it. I’d like to talk to someone who is a teenager now in 10 or 20 years for their take on films of this generation and memorable pop culture experiences. If they haven’t seen any of John Hughes’ work or other films from the 1980s, I’ll recommend they start there and then catch up on Easy A. Because, if not for its homage to the decade I was born, Easy A would be down a grade for me. Continuing on with boy meets girl, the story of Bob and Charlotte is one of my other favorites. I remember seeing Lost In Translation in college and just being amazed. From the scenery in Tokyo to the music and the performances by Bill Murray and Scarlett Johannson, I can’t believe I haven’t watched this film more since then. A snowy Sunday evening was perfect to watch it and escape for a while. Bob (Murray) and Charlotte (Johansson) are in Tokyo for their respective reasons and meet each other at their hotel. The meeting builds over time from a smile in the elevator to a glance at the hotel bar and …. sigh …. another karaoke scene to melt my heart. It’s like they’ve known each other forever and couldn’t resist their moments together. Writer and director Sofia Coppola also plays out the culture of Japan as Bob and Charlotte find what they are missing in their own lives with each other. They’re both married, but struggle with what they have with their spouses. Charlotte is a newlywed and says she doesn’t know who she’s married to. Bob is married for 25 years and his wife is just there for the kids, not him. There is some symbolism in their dialogue … Bob saying he’s planning a prison break or that he needs to get out of there and Charlotte saying she’s stuck and doesn’t know what she’s supposed to be. I don’t know how, but what they’re lacking, they find in each other. Interestingly, their relationship is not so much played out romantically on screen but as a connection neither of them can define or escape. Bob is in the cab to the airport and sees Charlotte on the street again after they said goodbye at the hotel. He stops her and whispers something in her ear, which the viewer does not hear, and they kiss for the first time. Bob still leaves, but the fact he said something to her leaves the viewer with the feeling that what is meant to be, will be. I can’t wait to see Coppola’s latest, Somewhere, but Lost in Translation will always have a special place in my heart. P.S. Check out this link about role Bill Murray has missed/passed up, who knew?!? I’ll take any reason to see (500) Days of Summer. Being that it’s Joseph Gordon-Levitt’s birthday today (I didn’t seek out this info — it was just on my imdb.com home page) and I recently read a blog rating this flick as one both men and women can glean some substance from while on a date (http://blog.moviefone.com/2011/02/14/girls-on-film-redefining-date-movies/), I decided to watch it again and see how so. There is an underlying theme to the story which, as the narrator states, is of boy meets girl. It’s not a love story. I feel like the divide between a man and woman on a date watching this movie is removed because the roles are reversed between Tom and his girlfriend Summer (Zooey Deschanel). Living it out on paper as a greeting card writer, Tom meets Summer at work. It’s too easy. But, they do fall in love and she falls out of it. The sequence of their relationship is mish-mashed throughout the film, further burying the few rom-com stereotypes it has. It’s just a refreshing view on the trials and tribulations of romance, plain and simple. I think I’ve seen this one at least four times now and have managed not to dissect it too much and decide the relationship between Tom and Summer is what I’ve been missing all my life. Not so. The film’s creators even warn the viewers against doing that in the beginning. “Author’s Note: The following is a work of fiction. Any resemblance to persons living or dead is purely coincidental.” The disclaimer, I think, can take any tension away between two people on a date. I’ll admit I needed a comedy palette cleanser after seeing Blue Valentine, but I love love love this movie. Going into it I knew it took years and years to come together and Michelle Williams and Ryan Gosling were on board with writer/director Derek Cianfrance to do it. That right there compounds the strength of this film so much, I think it will be hard to stop thinking about it, or to not see it again someday. Essentially, Cindy (Williams) and Dean (Gosling) fall in love and fall apart in this film. It happens through scenes told in past to present, both in the characters’ individual lives and time together. While watching, I tried to pinpoint something that shows why they lost each other but came to realize it didn’t matter, it was that they did. Cianfrance interestingly juxtaposes their building love with the fact that it dwindles and I can only describe it as watching onscreen what a labor of love Blue Valentine was for its creators and cast. It’s interesting that he says Blue Valentine is the story of him and his siblings struggling to move on from their parents’ divorce. Whatever that must have felt like was clearly written into Dean and Cindy’s relationship on screen. Perhaps they fall apart because they don’t know anything else, but again it doesn’t matter. Everyone involved in making this film took the literal story and made it for an audience to take in. If it had been a book the reader could take the words and apply them to their own life or find some alternate meaning, but as a viewer I took Blue Valentine for its brilliant face value. It has a lot of heart and love, from beginning to end. It feels like a long time since I’ve seen The King’s Speech and that’s a big no-no when it comes to writing this blog. In over a week working at the newspaper, I compose so many other pieces that my favorite subject gets pushed way to the back of my brain. But, I’m dusting it off and there are definitely some gems in this lovely, and sometimes heartbreaking caper I couldn’t forget. 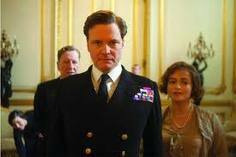 Colin Firth is King George VI after his brother King Edward VIII (Guy Pearce) concedes the throne. He is certainly qualified and has the loving support of his wife (Helena Bonham Carter) and two daughters. But, he also has a stammer that prevents him from public speaking, especially as the king of a country about to go to war. Said wife, Queen Elizabeth, finds Lionel Logue (Geoffrey Rush) to help her husband actually speak the words within him to lead his country. It’s really a complex story told at a time of historical turmoil, but seems so effortless on screen. And, the relationships between the characters are most prevalent despite the serious war backdrop to what’s going on. The king resists working with Lionel as his speech therapist, even though he knows he can help, because he doesn’t want to let his guard down. Lionel has a silent persistence until Bertie agrees to receive his aid, proven to work by a recording of him speaking clearly and with no stammer. They progress through various techniques like tongue-twisters, jumping jacks and quitting smoking for Bertie. As long as he doesn’t have to get personal with Lionel, he’ll do it. But that’s exactly what happens and I think is what cures his stammer once and for all. There was much unrest between Bertie and his brother and at the time their father died, the strain in the family grew. It all goes back to Bertie’s childhood, which he only talks about in my favorite scene in the film — with Lionel. It too, like the rest of the movie, was effortless on Lionel’s part to get Bertie to dish about growing up. As a story with a factual basis that can focus more on what’s behind the scenes, The King’s Speech is truly brilliant. As I discussed in Oscar Season, the hype that The Social Network could oust The King’s Speech and the other eight nominees really gets me fired up. I have an allegiance to the Coen Brothers and True Grit, but if a film about the modern forms of communication that was nowhere near as well done as Tom Hooper’s story of people actually talking to each other wins the Oscar, I’ll be speechless.